Habitat For Humanity collects twin-size beds from University Towers, some of which ended up being shipped to Haiti to help those in need. When the spring semester let out and students began exiting the residential halls for the summer months, FIU Housing and Residential Life faced an interesting dilemma. With the department ordering approximately 400 new full-size beds for students moving into University Towers for the upcoming fall semester, they had to find something to do with 452 smaller twin-size beds that were no longer needed. A few years ago, these beds would be sent to a local landfill and that would be the end of it. But for the past three years, Housing and Residential Life and the Office of University Sustainability have partnered for the Give & Go Green project, and together they found two local organizations to donate the beds to, giving the beds a new life and purpose. 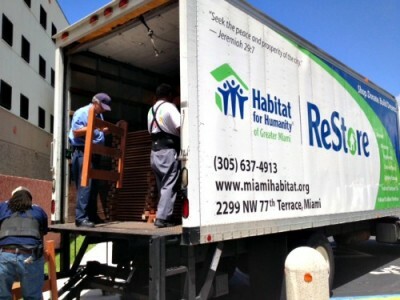 Habitat for Humanity took 102 of the donated beds, some of which were purchased and then sent to be used in Haiti while others were sold off to individual homes in South Florida at affordable prices. Goodwill Industries of South Florida took the approximately 350 other beds and distributed them to four locations in the area where they were sold in two weeks. The profits from the sales are being used to help fund Goodwill’s mission to provide rehabilitation, on-the-job training and work experience for individuals with disabilities and special needs in South Florida. “We were very excited to have received these beds, and we’re looking forward to partnering with FIU for future projects,” said Lourdes de la Mata-Little, vice president of marketing for Goodwill Industries of South Florida. It’s an ideal sustainability project, according to sustainability leaders at FIU. “Sustainability is made up of three things: economic prosperity, environmental stewardship and social welfare. With this program we hit all three, making it truly sustainable,” said Office of University Sustainability Assistant Director Carrie Kashar. “We’re saving money for the university on disposal costs, we’re helping the environment by keeping it out of landfills and we’re helping local people in need with supplies that they can use. 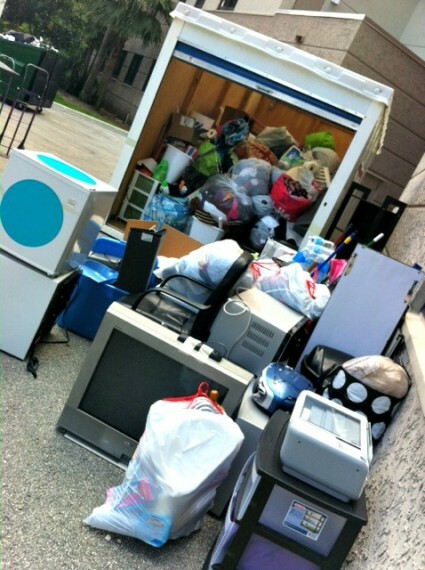 FIU students living in housing donated thousands of pounds of materials for the Give & Go Green project. Thanks to the donated beds, the Give & Go Green project, an annual effort to reduce waste by collecting unwanted items from students moving out of FIU housing for the summer months and donating them to local charities, had its biggest drive yet this summer. This year, students contributed an eclectic variety of items, ranging from televisions and microwaves to reusable Christmas trees and pairs of crutches. One student even donated a DJ mixer. Kashar and others hope that this project continues to grow, perhaps even culminating in the creation of an FIU-specific food bank in the near future. Hosuing Facilities Assistant Director John Tallon would also like to see the project grow and see even greater student involvement, believing that if each student donated just five pounds worth of items to the Give & Go Green project, it would make a big difference for the university and the local community. The 2013 initiative logged the highest numbers thus far in the relatively new program: 62,887 pounds worth of items donated to local charities. Of that total, the beds made up 56,500 pounds.